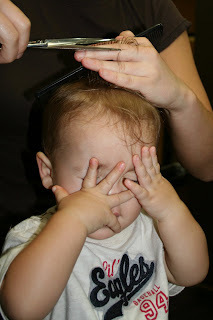 Leyton can be a big helper. He does pretty good with wanting to help and then listening to instructions. He still gets sidetracked and kept on saying that he didn't want to fall off of the little shed. Whenever I do anything in the house that involves a screwdriver or pliers and Brannen finds out about it, this is what he is doing. I can hardly get anything done. The sink got clogged and then the pipes decided to break. Here is Brannen and I fixing it. Brannen is busting out his cheese face. I received a total of 4 comments of how beautiful and pretty SHE is. So I was reaffirmed that, yes, a haircut was necessary. He sat surprisingly nice and still on his daddy's lap. Every now and then it would tickle and he'd squirm a bit. 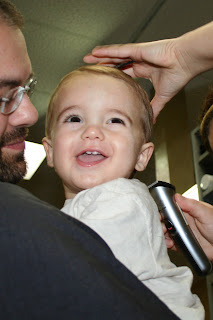 The curls are now gone, but at least I have my son back...! Last Friday while I was working, the boys got a great package from their Uncle Sam and his family. They were so excited - lots of pretty unusual "Cars Cars" toys, like the Sarge and Red Shake N' Go, the airplane, Wii game, and a neat book called "You're All My Favorites" with the stuffed animals to go with! With Brannen starting to walk, he likes to go after the cars. It has been lots of fun! Anyone who knows babies, knows that even moments of silence means there's trouble. Here is how we found Brannen after only moments of him playing around on his own while we were working around the house... 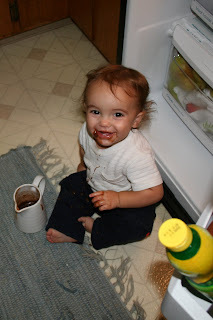 He had helped himself into the fridge and found a container of "medicina" - which is the yummy chocolate syrup/frosting Brad's Grandma Deloris used to make. And boy was Brannen proud of himself, letting out this "ah uh" hearty proud laugh. I'll have to put up the video of him later, it's great! Off to the bath we went! Waht a hoibrlre tmie we had tihs week! Just a rough week. First off Brannen got sick earlier this week and just didn't come around. So on Wednesday evening Susie got pretty worried about Brannen. He was just laying around and had zero energy. He looked rough. We took him to the ER and they gave him an IV of fluids. He perked up and seemed pretty good. When we got home at about 11:00 Leyton got out of bed and came to the living room and threw up in the room. So while I cleaned this up Susie got sick. So now 3 sick and dad is cleaning up. I felt good and was ok. In the middle of the night Susie and the boys all got sick several more times...finally a few hours later I got sick too! Nasty. So we spent Thursday sleeping and sleeping and sleeping. Tara Bohl brought us some soup and sprite. That was nice because it was so perfect to have some sprite. Today we are all up and moving but not at full steam yet. Brannen seems to have some lingering problems. Could be Rotovirus?